A view of Numa River (沼川) and Mount Fuji as seen from Tagonoura (田子ノ浦) in Shizuoka Prefecture. In front is a comparatively large sailing vessel with raised square sail. Called Bezaibune (ベザイ船), these cargo boats were told to have a capacity of 1,000 koku of rice. The Numa River belongs to the Fuji River system and was an extremely important maritime highway during the Edo and early Meiji Periods. 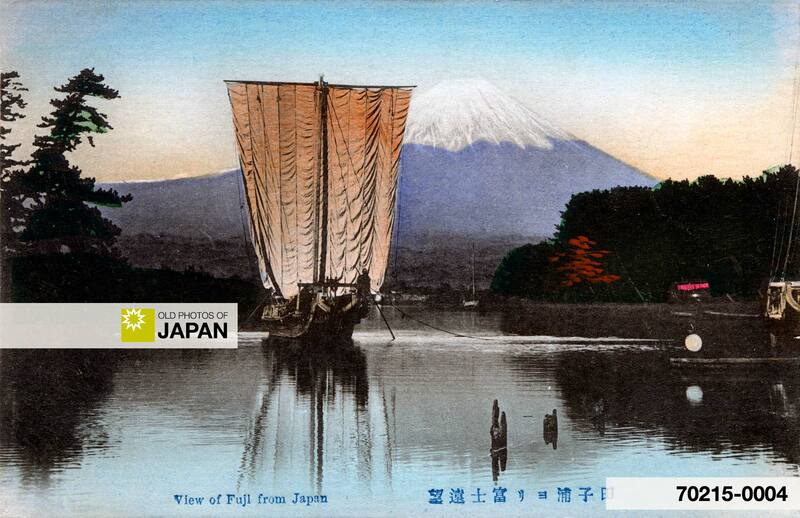 Large amounts of rice were transported over this system to Edo (current Tokyo). Mt. Fuji was a popular subject for ukiyoe woodblock artists and photographers and there are countless ukiyoe, photographs and postcards of this sacred mountain. This view from Tagonoura was especially popular. It often featured sailing vessels like the one pictured here. Poets loved this site as well. Yamabe no Akahito (山部赤人 or 山邊赤人, 700-736), especially famous for his 50 works in the Manyoshu (the oldest existing collection of Japanese poetry), composed a poem inspired by the beauty of this location. It is part of the well-known and well-loved Ogura Hyakunin Isshu, a traditional anthology of Japanese waka poetry. The area is now heavily industrialized and has a large number of factories for chips, paper pulp, corn, cement, as well as many fuel oil refineries. This has caused a lot of environmental problems that have seriously damaged the quality of the water in the river and Tagonoura Bay. Starting in the 1950s, the pollution actually became so bad that it contributed to the destruction of primary fish resources. Since the introduction of new national water-quality regulations in the 1960s, the quality of the water has improved somewhat and in spite of all the factories, there are still some fishermen left in Tagonoura. The romantic beauty of this photo however is gone. Only the snow on Mt. Fuji, about which Yamabe no Akahito so lyrically wrote, remains. Due to Global Warming, though, even that will soon fade away. The Google map shows the location of the modern Tagonoura Port. 1 MacCauley, Clay (1899). Hyakunin-isshu (Single Songs of a Hundred Poets): Literal Translations Into English, with Renderings According to the Original Metre. Asiatic Society of Japan. You can also licence this image online: 70215-0004 @ MeijiShowa.com. Just discovered your blog. Awesome! I love the pics. I climbed Fuji this past July from Tagonoura. It took 25 hours with no meals, no sleep and just short breaks in the hike. My group of 8 read the poem you listed above at the beginning of the trek and collected water from the port which we poured at the summit. It was sad how polluted the water was and the port scenery lacked all the beauty of this old pic. Perhaps when we make the climb this year, I’ll bring a copy of the pic with me and close my eyes as the poem is recited, imagining the world as it once was.